Baeza is a town of approximately 15,000 in Andalusia, Spain, in the province of Jaén, perched on a cliff in the Loma de Baeza, a mountain range between the river Guadalquivir on the south and its tributary the Guadalimar on the north. The town has existed since Roman times, when it was called Beatia, but it is chiefly known today as having many of the best-preserved examples of Italian Renaissance architecture in Spain. 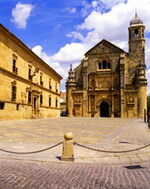 UNESCO added Baeza and Ubeda to the World Heritage Sites list in 2003. In the Middle Ages Baeza was a flourishing Moorish city, said to contain 50,000 inhabitants, but it fell to the forces of Ferdinand III of Castile in 1227. The Cordova and Úbeda gates, and the arch of Baeza, are among the remains of its Moorish fortifications. In the 16th century, Baeza and nearby Úbeda grew rich from the production of textiles, and local nobles hired important architects, such as Andrés de Vandelvira, to design new palaces, churches and public squares in the fashionable Italian style. The economy collapsed in the 17th century, which had the fortunate side effect of preserving Baeza's Renaissance architectural legacy, because few newer structures were built. Baeza appears much more Italian than Spanish, with an unusual sense of lightness, order, and proportion. Baeza's chief Renaissance structures are the university, established in 1538, which is now a summer school for the University of Granada, the Catedral de Santa María, the Palacio de Jabalquinto, and the squares of Plaza de España and the Paseo de la Constitucíon. All of these sites are located within walking distance of each other, in what is called the Zona Monumental. 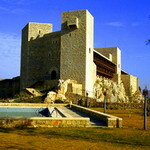 Baeza is 327 km (203 miles) by highway south of Madrid. It has a RENFE rail station (Linares - Baeza) 9 miles southwest on the Linares-Almeria railway and bus transportation from Granada, Málaga and Madrid. The nearest international airports are in Granada, 132 km (82 miles) south and Málaga, 241 km (150 miles) to the southwest. 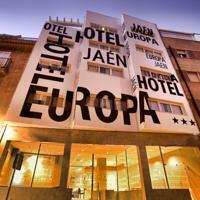 Hotel Campos de Baeza is located in the historic town of Baeza in Jaen, Spain. It lies one kilometre from the Baeza Cathedral, and 1.5 kilometres from the Arabic Baths. This seven-storey hotel has classical styling with modern touches, and multilingual staff at the 24-hour front desk can offer concierge services and tour assistance. The hotel's air-conditioned public areas offer wireless internet access, and there is garage parking for a surcharge. Restaurant Asador Campos de Baeza serves regional specialities and Mediterranean dishes, in a contemporary room with traditional styling. Cazorla lies at an elevation of 836 metres on the western slope of the Sierra de Cazorla. It is the entry point and base for visits to the Natural Park of Sierras de Cazorla Segura y las Villas, a vast protected area of magnificent river gorges and forests. Spain's second longest river, the Guadalquivir has its source in the mountains to the south of the settlement. The town is constructed around three main squares, the Plaza de la Constitución, the Plaza de la Corredera (or de Huevo, "of the Egg", because of its shape), and the Plaza Santa Maria. This last square is the oldest and is connected to the other two by narrow, twisting streets. It takes its name from the old cathedral which, damaged by floods in the seventeenth century, was later burnt by French troops. It is now in ruin. 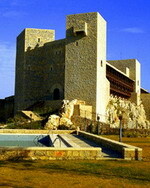 Above the square sits an austere, reconstructed Moorish castle tower called la Yedra. Still higher up on the rocky escarpment lie the ruins of still yet another ruined fortress. A recommended excursion is to the nearby village of la Iruela which has a ruined Moorish fortress perched on a daunting rock peak. A number of battles were fought here during the Reconquest until Don Rodrigo Jimenez de Rada, archbishop of Toledo, reconquered it in 1231 and made it the seat of his archbishopric. Today Cazorla is heavily dependent on tourism and hosts events such as the Cazorla Blues Festival each July. There is also production of high-quality olive oil from the one third of municipal land planted in olive trees. There is even a publication, The Olive Oil Gazette, which is published in Cazorla. Sierra de Cazorla is the Denomination of Origen for this olive oil. 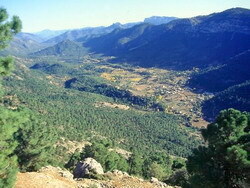 See Sierra de Cazorla. The town celebrates its annual fair in mid-September. For such a small town there are a surprising number of three and four star hotels and countless rural guest houses. Winter nights can be cold due to the elevation but snow is infrequent. Summers are cooler than the low-lying plains to the west and the town fills with tourists during the summer months. 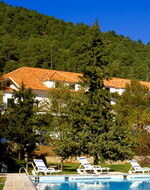 Charming hotel in the heart of nature - The Hotel is located in the Heart of Cazorla Nature Reserve, in the spot known as Sacejo. Its high location means it benefits from unbeatable panoramic views over the surrounding area with its abundance of pine-filled hillsides typical of the mountains. The quiet atmosphere and beautiful enclaves such as Cañada de las Fuentes or Linarejos waterfall make it a meeting spot for nature lovers. 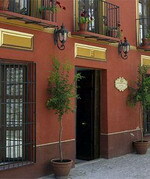 The hotel follows typical Andalusian farmhouse tradition, highlighted to the exterior. The swimming pool has marvellous views out over the Nature Reserve and the pleasant lounge with its chimney breast to the inside is characterised by the bright light streaming in through the large windows. Seasonal game forms part of the cuisine available at the restaurant with dishes such as wild boar in red wine and grilled venison fillets. Exceptional 18th Century Arabic Fortress - The hotel's privileged location on the Cerro de Santa Catalina adds a defensive, fortress-like character to the Jaén landscape. With a refreshing swimming pool and exterior stonework that soaks up the sun, the hotel promises to enchant you with a full experience of the Andaluz Renaissance. The building's majestic appearance continues inside with the impressive 20 metre high arches in the main hall, the dining room with its distinctive Arabic character, and the comfortable bedrooms with their magnificent views. The soft interior decoration of the building is complemented by a varied gastronomic menu. Try our ajo blanco, an exquisite dish made with garlic, oil, almonds and bread. And do not miss the terrina de perdiz (partridge terrine), the pipirrana (typical salad) and the ciervo al estilo de Baños (venison). 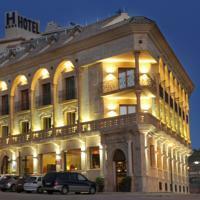 This modern hotel is located in the city centre of Jaén and features a terrace with views over the cathedral. It offers rooms with free Wi-Fi, air conditioning, a TV and private bathroom. The central location of the Europa allows guests to explore the city and its many monuments by foot. 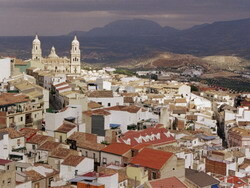 The hotel can organise bicycle rental and guided tours around Jaén and its neighbouring cities, Baeza and Úbeda. The property is conveniently located for those visiting the IFEJA congress site. There is a bus station just 200 m from Hotel Europa, and many restaurants and tapas bars can be found 100 m away. Private parking can be found around 200 m from the hotel. There is a sports centre with a swimming pool 600 m away. Torres de Albánchez is a village located in the province of Jaén, Spain. According to the 2005 census (INE), the city has a population of 923 inhabitants. 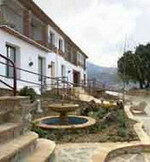 The Hotel Rural Puerto Magina is located in Torres, Spain, three kilometres from the town centre. Jaen is 33 kilometres away and Ubeda is 53 kilometres away. Surrounded by lush gardens, the Hotel Rural Puerto Magina is housed in a modern rustic-style property and is perched on a hilltop overlooking rolling valleys. There are panoramic views from the outdoor pool, and there is an onsite bar and cafeteria. Puerto Magina restaurant serves regional and international dishes al fresco on the panoramic terrace. A complimentary breakfast is served daily. The hotel houses 18 air-conditioned guestrooms and apartments finished with modern decor, dark wood furnishings and floral fabrics. 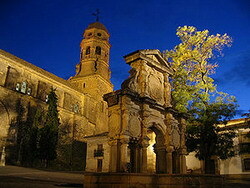 Úbeda is a town in the province of Jaén in Spain's autonomous community of Andalusia. It has 34,462 (INE 2008). Both this city and the neighboring city of Baeza benefited for extensive patronage in the early 16th century resulting in the construction of a series of Renaissance style palaces and churches, which have been preserved across the centuries. In 2003, UNESCO declared the historic cores and monuments of these two towns a World Heritage Site. The most outstanding feature of the city is the monumental Vázquez de Molina Square, surrounded with imposing Renaissance buildings such as the Palacio de las Cadenas (so named for the decorative chains which once hung from the façade). The Chapel of the Savior or Capilla del Salvador was constructed to house the tombs of local nobility. Both the interior and exterior are decorated; for example, interior has an elaborate metawork screen by the ironworker Bartolomé de Jaen. 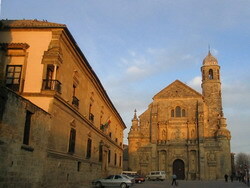 The Hospital de Santiago, designed by Vandelvira in the late 16th century, with its square bell towers and graceful Renaissance courtyard, is now the home of the town's Conference Hall. Ubeda has a Parador hotel, housed in a 16th century palace which was the residence of a high-ranking churchman of that period. The town lends its name to a common figure of speech in Spanish, andar por los cerros de Úbeda (literally 'to walk around the hills of Úbeda'), meaning 'to go off at a tangent'. 16th Century renaissance palace - in the aristocratic, monumental city of Úbeda, in its purest Renaissance plaza and next to some of its most beautiful buildings, the Parador occupies a palace, built in the 16th century and remodelled in the 17th, which once belonged to the Dean of the Holy Chapel of the Saviour. Behind the façade is a very beautiful inner courtyard, with a double gallery, the upper tier of which is glazed. The comfortable and welcoming rooms are remarkable for the height of their ceilings. Particularly outstanding are the six looking onto the plaza, and the suite on the opposite corner, with panoramic views of the Plaza de Vázquez de Molina. Sit down in the Parador’s dining room, take up a menu and enjoy. Bull’s tail in loma red wine, stewed kid with pine nuts, peppers stuffed with partridge… Whatever you order, success is assured. Andalusian details and ceramics decorate the dining room. Hotel Rosaleda Don Pedro lies in the centre of the city of Ubeda, Andalucia, Spain, 100 metres from the attractions of the old town. Those include the archaeology museum of the Mudéjar House (50 metres away) and the historic square, Plaza Vazquez de Molina (100 metres away). This three-storey hotel was built in the 16th century in traditionally Spanish style. It features an inner courtyard with a sun terrace and an outdoor swimming pool. Restaurant Renacimiento offers Mediterranean cooking in a room with timbered ceilings and a tiled floor. The 41 guestrooms have light pastel decor, traditional Andalucian furnishings and patterned fabrics. 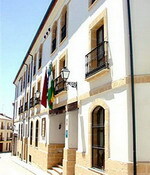 This 17th century house, in the heart of the historic and artistic centro of Úbeda, declared a National Heritage Site by UNESCO, has been meticulously restored and decorated by Manuel, a loyal Rusticae customer whose experience of visiting hotels has served to teach him how to pay attention to the smallest of details when creating his own hotel. The building bears the Molina coat of arms and is typical of Renaissance architecture. The décor is classical with antiques and stuccoed ceilings of great value. There are large windows and high ceilings and the materials used have created a monastic atmosphere in contrast with the latest technological facilities as if a pact had been made with the devil. The guest rooms, all with women’s names, overlook a patio with Renaissance columns and the walls are decorated with original art works and in some cases with stone from the Úbeda walls.